No one likes to admit how important money really is to them. That’s not to say that they’re greedy or have their priorities wrong, but to understand that everything has a cost in life. That being said, it’s easy to act as though money is a small or unimportant part of life when you have a stable income, but when money is sparse or not coming in, it can be difficult not to panic. There are a few instances in life when you may be forced to deal with a small break in your income. Maybe you’re a teacher and experience this every summer when you go on break. Or maybe you were let go or decided it was time to move on from your current job, in which case, you may have a period of time during the job hunt when you don’t have a monthly salary. Whatever the circumstance, there are ways to navigate through this difficult period. 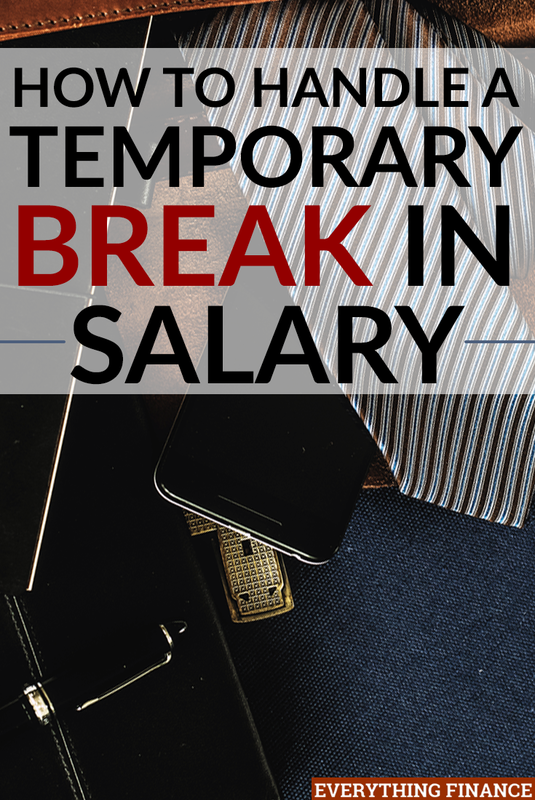 Here are some things you can do to handle a temporary break in salary. A surefire way to handle a break in salary is to get a side job or some sort of temporary work. Whether that means getting a position at your favorite store, waiting tables, or opting to do freelance work, a side job can help ease the weight of not having a monthly salary. If you’re a teacher, having a temporary position or freelance work can help during that summer break and give you the opportunity to try a different kind of work. If you’re in between jobs, don’t get hung up on taking a position not within your desired career track. A temporary job is just that, something to get you by. However, if you’re job searching, freelance work can be a great option because it allows you to build your portfolio and gives you plenty of time to keep searching. If you don’t have a steady salary coming in on the regular, it only makes sense that you keep meticulous track of your spending. It’s easy to get in the habit of making spur-of-the-moment purchases or to keep saying “oh, it’s only $40”. But, you’d be surprised how quickly those add up, often times catching you unaware. That being said, even if you have a side job, you’re probably not going to make what you would at a salaried job. So be sure to keep track of all bills, expenses, and receipts to notice where you spend too much and where you’re doing great. It’ll keep you on track with your finances. Once you get accustomed to a certain lifestyle, it can be difficult to break it. Logic tells you, however, that if you have a change or break in salary, you’ll have to adjust your budget accordingly. Come up with a budget in relation to your lowest earnings. Make a list of all the expenses you need, like groceries and gas, and then make a list of everything you absolutely have to pay for. Try to stick to a budget that consists mostly, or maybe only, of those items. Now is not the time to have a large budget section of entertainment or fun money. This isn’t to say you can’t treat yourself every now and then, but ensure you get everything important paid off first with the limited funds you may have during this time. If you’re like me, this may be the hardest guideline yet. Even if you’re a teacher or someone who knows your salary will pick back up soon, it’s still a good idea to hold back during a time when things are sparse. This is especially true in the case of online shopping. It may be easier to stay away from actual brick and mortar stores, but the convenience of the Internet has made shopping as easy as the click of a button. Don’t allow yourself too much browsing time on online stores or let yourself rationalize a purchase. Your budget will look much happier if you can stick to this rule. This is obviously only an option if you’re in between jobs and not just on a temporary break. While this may not be the most fun option, it’s a good option if your job search seems to be taking forever. Yes, this should only be used as a last resort. But if you’re really starting to struggle or panic financially, it may be your best option. This option isn’t to encourage being unemployed, but merely to help you while you get back on your feet. All that being said, there are lots of guidelines for being eligible, so it’s important to understand those first. If you’d rather not get a full-time, temporary job or need something more flexible, one of the best things you can do is be creative during your break. Whether that means using one of your talents, such as crafting, or doing something you love, like walking dogs, babysitting, or even cleaning, you can always find odd, but flexible jobs that can provide some income. Try to think outside the box and get creative when it comes to finding methods of employment. You might end up doing something you love while you wait to go back to work. Having a temporary break in salary can be kind of unnerving, especially if you’re unsure of how long that break will last. Nevertheless, there are ways to adjust your finances and steps you can take to make any break in income less scary. Whether that means finding something on the side, doing the odd job here and there, or adjusting your lifestyle and finances, there are ways to survive any type of break in salary. At the end of the day, the best thing you can do is just keep pushing through. Have you ever had a temporary break in salary? How did you handle that?